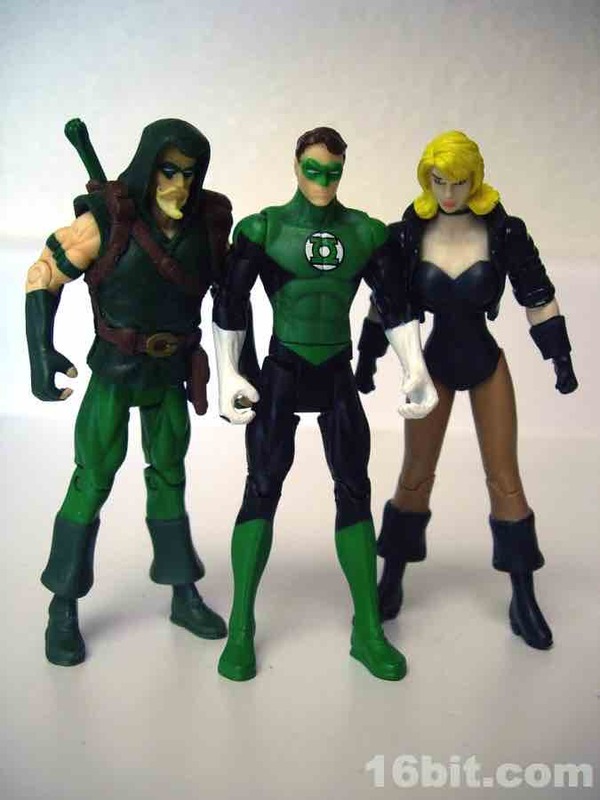 With her hubby Green Arrow, Black Canary is one-third of a pretty great 3-pack. The third wheel Hal Jordan is always in the way, but thematically it's a nice set. 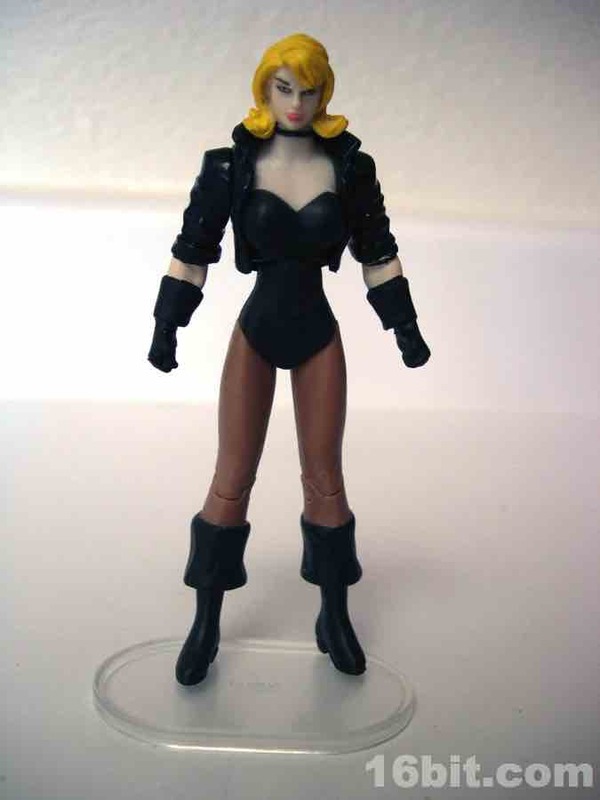 Mattel made sure Black Canary was made many times over, as she was sold individually carded twice-- the second time around she was labeled an "adult collectible for ages 18 and up" with no changes to the actual toy. Well, other than deco and packaging, it's still the same structure as this one. At the same basic height of the entire line, she fits in quite well. She can't stand easily on her own, so Mattel threw in a clear plastic display base to ensure she doesn't face-plant your display. Sculpted with a black jacket, her body type doesn't lend itself to reuse on many other characters. Most of the boys can share parts, though. Her unique physique is... OK. 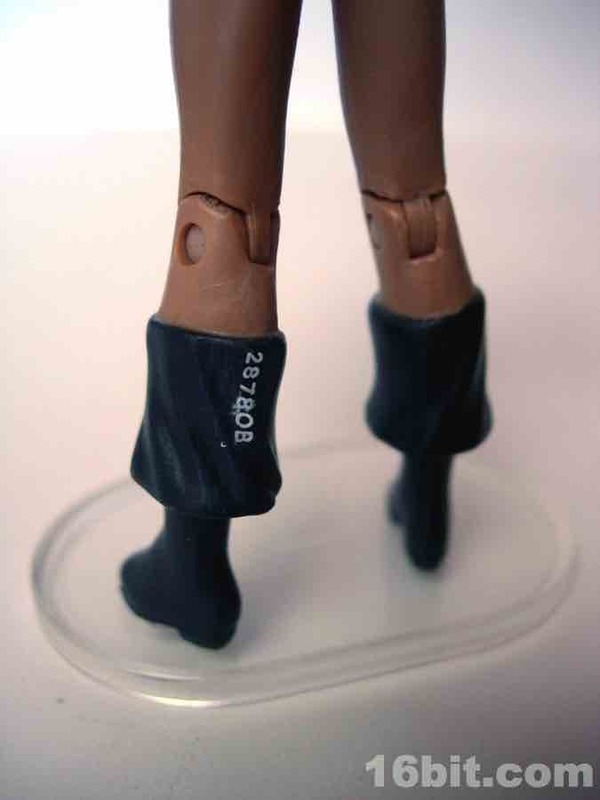 The legs are a little funky with the boots, and her arms have bunched-up sleeves and gloves. There's not a lot of arm articulation, but she does have knee joints and (relatively speaking) a sizable rack, which are the prerequisites of any good Black Canary toy. There aren't many of her, so it's not hard to make one that's basically OK. I'd say that describes her well-- she's not amazing, but at this scale you don't have a lot of options, and high-end statues are expensive. As a small toy, I think she'll fit the bill but I have no doubt Mattel could do it better if they had another shot at it. Given how the single Black Canary sat around, my guess is this will be it for this scale, even if they bring back a 3 3/4-inch DC Universe line of some sort a year or three down the road. I wouldn't buy the set just for Black Canary, but I guess for $5 you can do worse. Get it if the price is right, or if you want the boys from the set.